Brandon Dante Underwood (born June 24, 1986) is an American football safety with the Toronto Argonauts of the Canadian Football League. He was drafted by the Green Bay Packers in the sixth round of the 2009 NFL Draft and would later be a part of their Super Bowl XLV championship team over the Pittsburgh Steelers. He played college football at Cincinnati. He was released on September 3, 2011. On February 16, 2012, he signed with the Oakland Raiders. He was released by the Raiders on September 7, 2012. On December 31, 2012, Underwood signed with the Dallas Cowboys. He was released by the Cowboys on August 27, 2013. On January 9, 2014, Underwood signed with the Toronto Argonauts of the Canadian Football League. He was released by the Argonauts on August 31, 2014. Underwood was signed to the Calgary Stampeders practice roster on October 10, 2014. On May 30, 2015, Underwood re-signed with the Toronto Argonauts. ↑ "Green Bay Packers: Brandon Underwood". www.packers.com. 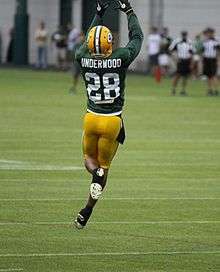 ↑ "Brandon Underwood among early Packer cuts". ProFootballTalk.com. ↑ "2014 TRANSACTIONS". argonauts.ca. Retrieved September 1, 2014. ↑ "Transactions". cfl.ca. Archived from the original on December 26, 2014. Retrieved November 1, 2014.